The water treatment chemicals include a corrosion inhibitor, a scale inhibitor, a bactericide, a cleaning agent, a degreaser and compound product thereof. These chemicals are not only diverse but also very different in nature, and require a large number of analytical methods. With the advancement of the times and science and technology, the types and functions of water treatment chemicals have also been greatly developed. Due to the limitations of analytical techniques and analytical instruments, and others reasons. Some new agents are very similar to the same type of old drug control indicators and analytical methods. Although there are national or industry standards, it is difficult to make an effective distinction. In actual work, we found that HEDP and PBTCA have the above problems in the analysis method. Their analytical principles are the same and the analysis steps are very similar. Under the current conditions, it is not effective to identify both. For this reason, some experiments were carried out and some supplementary identification methods were done. I hope to make up for the deficiencies of the existing analytical methods to a certain extent. 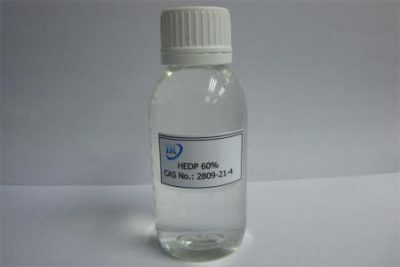 HEDP is known as 1-hydroxyethylidene-1 1-diphosphonic acid. It is the first generation of organic phosphonic acid scale and corrosion inhibitor. Industrial production was achieved in the 1960s. HEDP is a replacement for early inorganic phosphorus water treatment chemicals. It is structurally stable and does not decompose under normal photothermal conditions. HEDP is also an important chelating agent, which has a certain scale inhibition effect and also has a certain corrosion inhibition ability. However, HEDP is more sensitive to oxidative biocides. It is easy to break down. It is limited in the treatment of high concentration multiple cooling water. HEDP has a high phosphorus content. It may cause environmental eutrophication pollution during use. As environmental protection requirements become more strict, the use of HEDP will be limited. In addition, iron ions in water have a significant effect on the corrosion inhibition of HEDP. When the iron ion concentration is greater than 3 mg/L, the corrosion inhibition of HEDP decreases exponentially with the increase of iron ion concentration. PBTCA is known as 2-phosphonobutane-1 2 4-tri2carboxylic acid. From a structural point of view, it contains one – PO3H2 and three -COOH. PBTCA is a highly effective scale inhibitor. PBTCA also has a strong scale inhibition effect under the harsh conditions of high temperature, high hardness, and high pH. Especially in the presence of Fe3+, its scale inhibition and corrosion inhibition performance are better than other organic phosphonates. PBTCA has a good synergistic inhibition effect with zinc salts and polyphosphates. 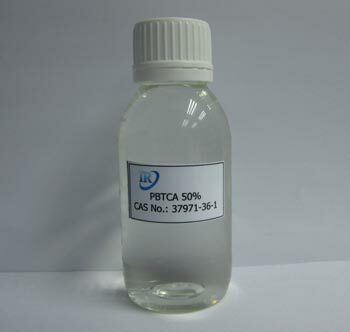 In addition, PBTCA has a low phosphorus content and is difficult to form insoluble organic calcium phosphonate scale. It has good antioxidant properties and good stable zinc action. PBTCA is stable in nature. It is not easily damaged by acid and alkali, is not easy to hydrolyze, and is resistant to high temperatures. PBTCA is also resistant to oxidative biocides. With the improvement of water treatment effect requirements and the increasingly strict requirements of environmental protection regulations, the application of PBTCA has received more and more attention. PBTCA and HEDP have no difference in appearance and are all colorless or light yellow transparent liquid. Their quality control indicators are also very similar. The most important indicator of the “active component” analysis principle is also the addition of sulfuric acid and decomposer under heating conditions. Convert macromolecules to phosphates. After adding the quinoxaline ketone solution, a quinoline phosphomolybdate precipitate is formed. After filtration, washing, drying, weighing, minus the content of orthophosphorus and phosphorous, the active component is obtained. The two are not only the same analysis principle but also the analysis steps. The difference is that PBTCA also requires the use of a nuclear magnetic resonance (NMR) spectrometer to measure specific chemical shifts on each 13C NMR spectrum to determine its structure. The specific chemical shift on the 13P NMR spectrum was measured to determine its purity. This cannot be done with existing analytical tools. If there is doubt about the sample, the analysis of each indicator alone cannot distinguish between the two. In this regard, after analysis, it was found that even though the active components of both were 50%. However, due to the different molecular structures of HEDP and PBTCA, the phosphorus content of the two is different. Whether spectrophotometry for determining total phosphorus content in existing circulating water can be utilized. They are decomposed under certain conditions to become phosphate. The total phosphorus content is then determined, and a preliminary determination can be made based on the difference in total phosphorus content. The above is about the introduction of water treatment chemicals HEDP and PBTCA quality inspection. If you have any other questions, please feel free to contact us.